This silver medal was authorised in July 1919 for service overseas between the dates 5th August 1914 and 11th November 1918 inclusive. As with the 1914-15 Star, service in Ireland did not count, even for those who took part in the Dublin Uprising of 1916. The award criteria was basically the same as that for the 1914-15 Star, and included all British, Dominion and Imperial personnel serving overseas in the three armed services; nurses and medical personnel who served in military hospitals; and civilian volunteers in officially recognised organisations. Eligibility for the RFC/RAF and Royal Naval Air Service also included pilots stationed with units based in Britain and who had actively engaged enemy aircraft and Zeppelins, those who had flown new aircraft to France, served aboard aircraft carriers, or had flown coastal reconnaissance patrols from the UK. It was also awarded to foreign nationals (mostly French and Belgians) who had served with or rendered assistance to the British forces, and secret agents working in the occupied regions. Also eligible were British nationals who served overseas with the French Red Cross. The qualifying period was extended to July 1920 for those serving in northern and southern Russia and Siberia and for mine clearance at sea or service in the Black Sea, Caspian Sea and eastern Baltic; and to 14th January 1919 for those serving in Hedjaz (in modern day Saudi Arabia) and Aden. There was one important omission in the award criteria compared to the previous awards though, and that was that overseas service did not have to be in a theatre of war. The implications of this are covered in more detail in the Single Entitlements section. 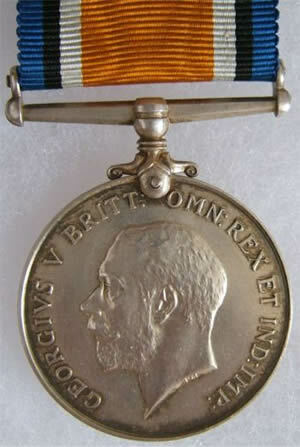 The obverse shows the head of George V, with the inscription, ‘GEORGIVS V BRITT : OMN : REX ET IND : IMP’. 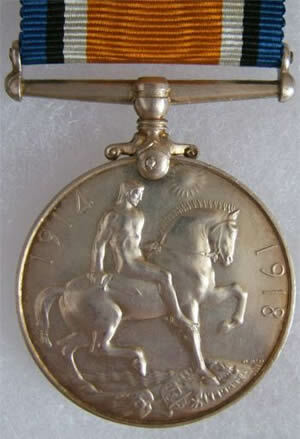 On the reverse is a naked man on horseback (reputed to be St. George), trampling the shield of the Central Powers and the skull and crossbones of death, whilst above him rises the sun of victory. The horse is said to represent man's triumph and mastery over forces great than himself. This reverse design was the work of the Scottish artist, William McMillan (1887-1977), who had himself served in France before being discharged with shell shock. McMillan's design was chosen by a committee, which included members of the British Museum and the Royal Academy, for which he was awarded a £500 prize. Over six million were struck with a further 110,000 made of bronze for men of the Maltese, Chinese, South African and Indian Labour Corps. The ribbon is of silk, with a broad orange centre flanked by blue, black and white stripes; the colours having no special significance.